The unmissable new action-thriller from one of the biggest names in British fiction - the No 1 bestselling author of The Ghosts of Sleath, Haunted, The Magic Cottage and The Rats. The unmissable new action-thriller from one of the biggest names in British fiction - the No 1 bestselling author of The Ghosts of Sleath, Haunted, The Magic Cottage and The Rats. As millions of readers around the world will testify, James Herbert's ability to shock and enthral is matchless. 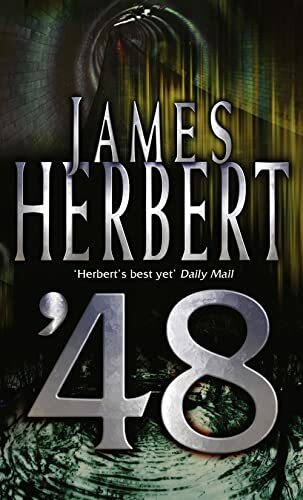 Now, in '48, he has surpassed his own remarkable achievements to create an electrifying new novel of pure heart-stopping action and invention that will take readers to new levels of terror and excitement. In 1945, Hitler unleashes the Blood Death on Britain as his final act of vengeance. Hoke, an American pilot and one of a tiny minority with a rare blood group unaffected by the deadly disease, has survived alone among the debris and the dead of London for three years. Now, in 1948, a slow-dying group of Fascist Blackshirts believe their only hope is a transfusion of blood from one of Hoke's kind. Ever more desperate as their deaths approach, they're after his blood.